Anaheim, Calif. – July 31, 2012 – GBC Motorsports is proud to announce the launch of a new DOT approved tire for Utility ATVs and Side-by-Side UTVs. The new tire, dubbed the Kanati Mongrel, will come in several sizes, with the first size now available from select tire dealers. The Kanati Mongrel’s tread pattern is borrowed from GBC’s affiliated light truck tire, the Kanati Mud Hog. The Mongrel features an aggressive diamond-shaped lug pattern that makes it suitable for a variety of off-road terrain. The Mongrel, however, isn’t just another off-road UTV tire. This 8-ply, DOT approved radial has a 600 lbs load capacity and boasts an impressive 87 MPH “N” speed rating. This combination of durability and performance makes the GBC Mongrel the first true all-purpose tire built specifically for utility ATVs and Side-by-Side UTVs. 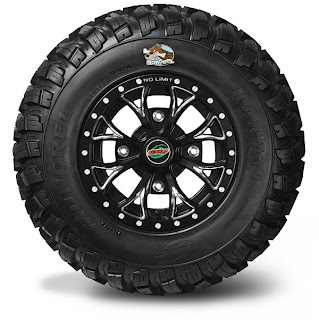 The first size will be 26×10.00R12 and is now available from the tire dealers and retailers listed below. More sizes will be available in September upon completion. The Mongrel will also be available through your local GBC Motorsports dealers. AE122610MG 26×10.00R12 8-Ply DOT 87 mph / “N” Now Available!